When the seasons change, so should grocery lists. Selecting produce that is in season is not only easier on the environment, but also more gentle on the wallet, and better for our health. Yogis have a wonderful explanation of why we should eat seasonal – cooling foods high in water content (like watermelon and cucumber) to combat dry summer heat and warming, nurturing foods like warm squash soup, hot chilies, sweet potatoes, and ginger for fall and winter. 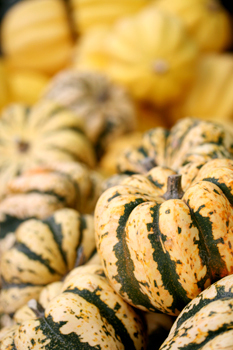 Seasonal fall foods, such as squash and sweet potato, contain immunity builders like vitamin A and C which are also responsible for healthy skin that can take a beating when the weather turns cold. But their hearty, creamy texture can make them take center stage on your fall dinner table. 1. Think orange, like the beautiful hue of Halloween pumpkins next time your stroll through the produce isle. Butternut squash, sweet potato, and carrots all get their lovely orange glow from beta carotene, the compound that our bodies turn into vitamin A. 2. Want to combat chilly nights, while burning more calories? Add hot chilies to your favorite foods. Chilies bring a lot of character and flavor to cooking without unwanted calories and fat, helping you to enjoy lighter meals and lose or maintain weight. Eating spicy, hot foods can also help you to feel full without eating large portions. Chilies also cause your body to create heat and increase your heart rate which causes more calories to be burned. 3. Ginger contains very potent anti-inflammatory compounds called gingerols, a relative of capsaicin that is found in chilies. Ginger has been used in folk medicine as a cure for nausea and seasickness, but I like it because it aids in digestion and contains antibacterial compounds that can be great in the winter months when colds run rampant. Add chopped fresh ginger to noodle dishes, stir fries, and chicken noodle soup for extra zing. 4. Tea. Drinking hot tea isn’t just to sooth a cold, tea has valuable antioxidants that help to build immunity while warming up the body when you come in from the outside. 5. Greens aren’t just for summer. We’re talking hearty cool weather greens like collards, kale, mustard, Swiss chard and turnip greens. They all belong to the same family as spinach – so it’s no wonder they contain high levels of many vitamins and minerals. Besides, they are good news for your waistline, because a cup of plain, cooked greens stays under 50 calories. They work perfectly in comfort food favorites like stews, soups, or anything that is long cooking. Add them to crock pot style beans half way through cooking. Good ideas, could you share some of your favorite skinny recipes using fall ingredients please. One of my favorite fall snacks is sweet potato fries (use Skinny Chef recipe) dipped in a mixture of Greek yogurt, fresh garlic, and chili powder. The spice really brings out the flavor of the sweet potatoes. What a delicious and healthy idea!!! Thanks for sharing Amy.